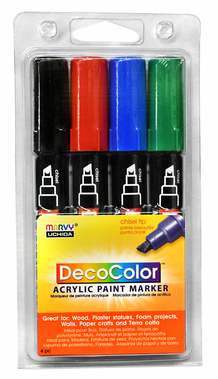 Paint and decorate your arts and craft projects with Decocolor Acrylic markers. They are available in 28 popular colors including 6 metallic colors. They have a 3-way chisel tip for thick and thin lines. Decocolor Acrylics are great on stone, terra cotta, concrete, paper and wood. 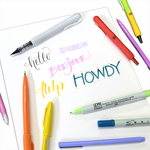 Water-based opaque pigmented acrylic ink is acid-free, non-toxic, and permanent when dry. * Avoid storing in extreme temperatures. Store between 60° and 85° F.
Check out the multicolor sets!